In my last post I talked about the importance of humidity when it comes to pianos staying in tune. 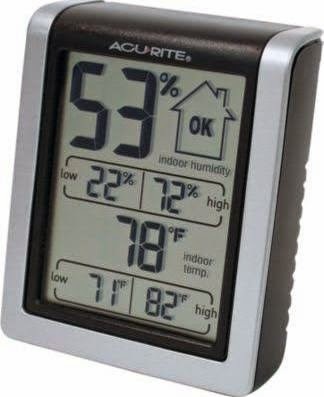 Here is an inexpensive hygrometer (humidity measuring device) that is available at Home Depot for around $10. The readout gives current relative humidity and temperature and also tells you what the high and low have been in the last 24 hours. These inexpensive hygrometers are not known for their precision. However, for the purposes of protecting the stability of your piano's tuning, absolute accuracy is not of paramount importance. Having a generalized idea of what the humidity is doing is the key. These can be purchased through Amazon (which may be the most inexpensive) or directly from Lascar Electronics. The really useful aspect of this device is that it can be set to take several readings every day over a period of weeks or months. 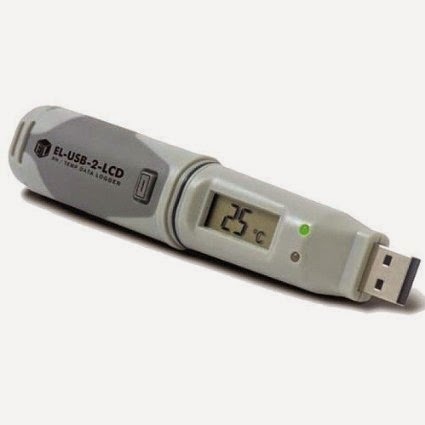 Then you can plug it into your computers USB port and view a graph that will show you the temperature and humidity over that period of time. This short video shows how this feature works. The whole point of measuring the humidity is to stabilize the piano's environment thus stabilizing the tuning. Another helpful tool in helping you achieve this goal is to actually measure a note on your piano with a free tuning app. My favorite for Android phones is Tunelab, which is actually professional piano tuning software that has a shareware version. The limitation of the shareware is that it times out every so often. (I think around 17 note switches causes a time out for 2 minutes). It would be best to measure a note right after the piano has been tuned. The best note to measure is lowest plain wire string, which on most upright pianos (and smaller grands) will usually occur somewhere around the F note below middle C. The lowest plain wire note will usually be the one to react the most with humidity changes. The reason has to do with the wire's tension and how close to its breaking point it is. Wires that are closer to their breaking point are more stable than lower tension wires. Another approach would be to just measure all the Cs on the piano and write down the frequency number. In the above picture the frequency of C5 is 528.58 Hz. During very cold weather, if you are unable to add enough humidity to the room to keep the piano's pitch from dropping, than adding a Dampp-chaser system with a humidifier will help. It will add the humidity directly to the piano instead of the room. Likewise if the frequency/pitch of a note is rising, it is a sure sign that the piano is taking up more humidity. Installing a Dampp-chaser system can bring the pitch back down if the humidity is running in the high 40's or greater. Paying attention to the relative humidity and the pitch of your piano will give you clear information on how humidity and tuning are related. Preventing rises and falls of pitch by controlling the humidity in the room and/or piano will help you get the most musical enjoyment and inspiration from your piano.